A black and white photograph of a graduating class at the School of Nursing at Ontario Hospital Whitby. Left to Right: Stella Ford, Miss Gertrude Bryan (Director of nursing), Catherine Deemert. 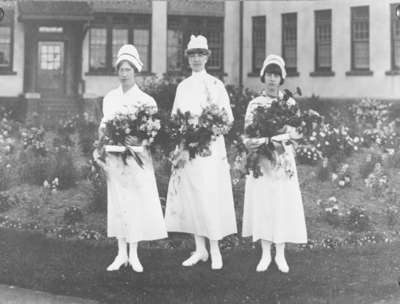 School of Nursing Graduates, 1922, Photographer Unknown. Whitby Archives 13-001-064.